So I don’t know about you, but I’m often frustrated by the ridiculous smallness of girls’ pockets. 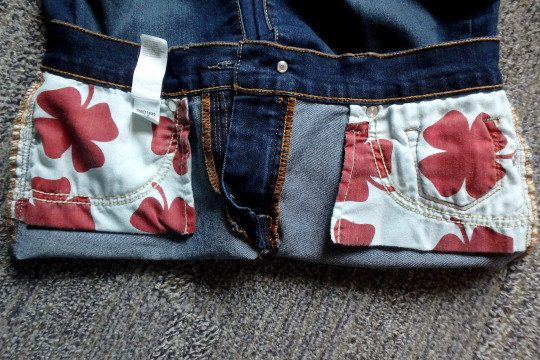 At a bare minimum, I need to be able to shove my cellphone in there – come on, pants companies! So what I started doing was making myself pocket extenders. I’ve done this several times, for pants and shorts. It’s great. 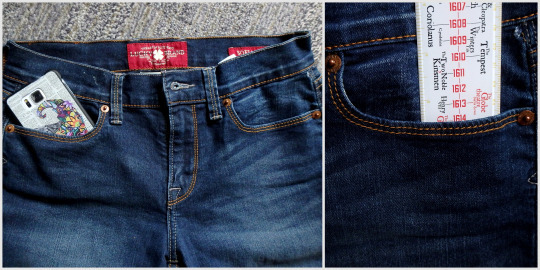 I just got this pair of jeans, so I thought I’d show you how to do it. I kind of feel like it just hasn’t occurred to some of you that this is an option, so maybe now it will. 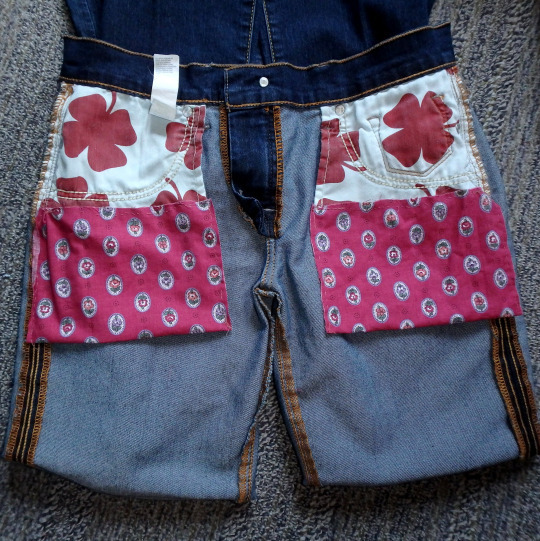 All you need is your pants, some fabric (I just took a random piece from a scrap bin), a needle, and some thread (thread doesn’t even need to match the fabric since literally no one will see it). See? Ridiculous. Like, half a cellphone, or only 2.5″. Useless. 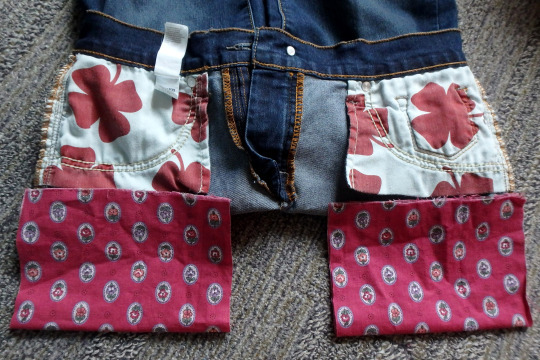 So turn those inside out to expose the pockets. then fold it in half again so you can have two equal ones. Try to get the edges to line up enough, pin it in place, then sew up the sides! Are your stitches crazy uneven and wonky looking? Doesn’t matter; nobody’s going to see it. These are in the inside of your pants. The only thing that matters is that it holds up. So I double-did the corners, since those tend to get the most stress. 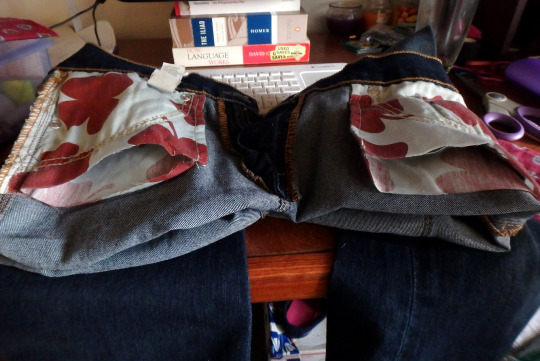 Cut open the bottom of the existing pockets. 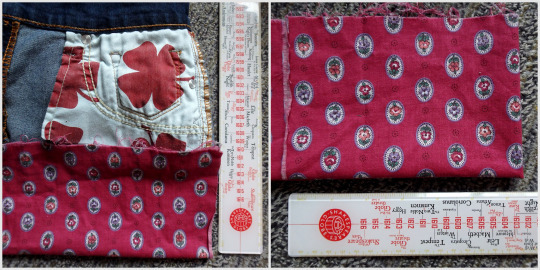 Pin it in place, then sew around, joining the new pocket to the old pocket. I did this by keeping my hand on the inside, so I wouldn’t accidentally sew through the other side. Again, I reinforced the corners, and didn’t worry about what it actually looks like. Then I turned it in side out to make sure the inside was all joined properly. Yay all done! And the pockets are so much bigger now! Whaaaat I can fit my entire phone and entire hand and probably something else now, are girls’ pockets even allowed to do that?! Heck yeah they are. You are a goddamn hero. More photos of the finished 1890s ensemble! I’m so happy with how this looks and photographs. It turned out exactly I wanted it to, which is the most wonderful feeling! This costume consists of four main pieces – a skirt, blouse, jacket, and hat. I used faux wool flannel and silk for the vast majority of the ensemble and It was designed, drafted, and made entirely by me. This project wasn’t difficult, but it did test my patience at times. I’ve never done this much pattern matching before and it was more time consuming than I had expected. I also ran into some road blocks with skills I was unfamiliar with…like making the collar, and designing soutache patterns. But I got it all figured out in the end! I’ve documented the process in great detail on my blog, those posts can be read here. More photos are posted here, and a video that shows the details and process of getting into this costume is posted here!